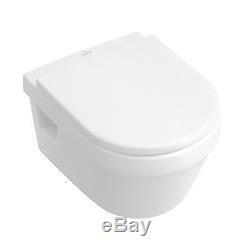 Villeroy & Boch Omnia Architectura Rimless wall hung toilet pan with Seat. For any V&B items you may require. Villeroy & Boch Omnia Architectura direct flush WC pan. &###xA0;genuine soft close seat included. Flush volume 4.5 Litres. Some Opened for images or inspection. All listings sell only described items. If stock image is used please be aware that no taps or other additional items are included unless specified. RRP: &###xA0;&###xA3;279+&###xA3;150=&###xA3;429+vat. &###xA0;Viewing is welcome, won&###x2019;t be disappointed. If you cant find specific item. And we will beat any quote and provide best trade deals around. Some of the items are not boxed where specified, boxes might be flappy or opened before as all of the items are&###xA0;being inspected and images taken before listing. All ceramic items and mirrors collected&###xA0;from HA5 Pinner near Harrow (London) Very easy access from M25 and M1! H for all collections, if other&###xA0;methods required please advise. &###x200B;&###x200B;&###x200B;&###x200B;&###x200B;&###x200B;&##x200B. Collections and couriers are welcome and strongly recommended for oversized or overweight items that we are not able to use nationwide services for. &###x200B;&###x200B;&###x200B;&###x200B;&###x200B;&###x200B;&###x200B;All collection from Pinner HA5 (London), easy access from M25, not far from Heathrow. United Bathrooms part of United Group&###xA0;is a supplier of premium bathroom goods at discounted prices. &###xA0;We only sell UK supplied and genuine branded goods from Villeroy & Boch, Keuco, Hansgrohe, Duravit, Grohe, Geberit etc. &###xA0;All items we list are held in stock but please do not hesitate to ask any questions beforehand. We can supply&###xA0;any German brand any&###xA0;bathroom products to order from current brochures/catalogues so please enquire. &###xA0;Please note that some items listed can be older stock and have dusty or tatty packaging. If packaging is important please enquire before purchasing. United Group cover&###xA0;United Builders, United Joiners, United Floors, United Windows and United Bathroom supply and fitting services within London and surrounding areas. Since we only deal online all collections and viewings are by appointment only in advance. Howerver visit slots have to be planned and adviced&###xA0;quite precise&###xA0;for all visits whatsoever. Important: most of our stock is brand new never openned BUT some of our stock it surplus, wrong orders, discontinued or with rough/tatty packaging. If this is important please contact before purchasing. Any damaged parcels should not&###xA0;be signed for or must be marked as "unchecked" upon signing for&###xA0;and must be reported back to us. Any product you return must be in the same condition you received it and in the original packaging with all labels. For any V&B items you may require. 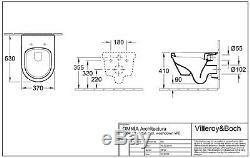 United-bathrooms Villeroy & Boch Omnia Architectura direct flush WC pan. Rimless genuine soft close seat included -Wall mounted -Horizontal outlet -With water-saving AQUAREDUCT® system -Flush volume 4.5 Litres New items fully boxed. Pan dimensions: 370x530mm Item code: 5684. R0.01 RRP: £279+£150=£429+vat Viewing is welcome, won’t be disappointed. RRP -£429+vat If you cant find specific item. Some of the items are not boxed where specified, boxes might be flappy or opened before as all of the items are being inspected and images taken before listing. All ceramic items and mirrors collected from HA5 Pinner near Harrow (London) Very easy access from M25 and M1! The item "Villeroy & Boch Omnia Architectura Rimless wall hung toilet pan& Seat 5684. R0.01" is in sale since Tuesday, August 22, 2017. This item is in the category "Home, Furniture & DIY\Bath\Sinks". The seller is "ubathrooms" and is located in Pinner, London. This item can be shipped to United Kingdom.